Good Afternoon Ladies. What Time is it? Yes that’s Right, time for another fall tag. The Crafters Work Shop called Time Travel (TCW201s). Then over stamped with Hero Arts (S5216 Garn Pattern). and there wasn’t stamp credits on it. 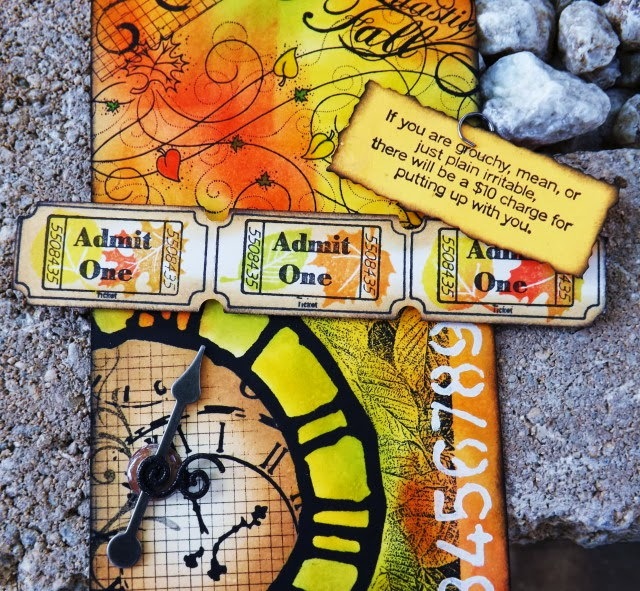 Die from Tim Holtz, along with stencil ( THS011 School House). 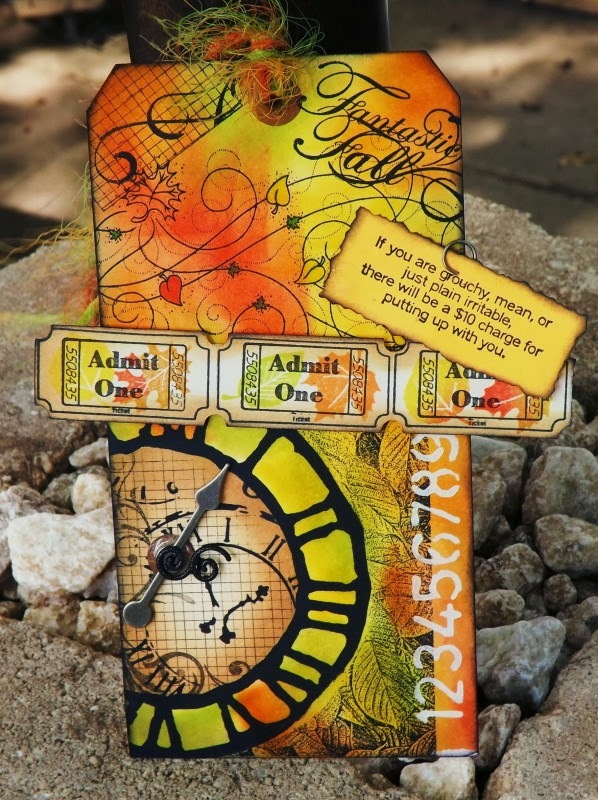 Large BG stamp of fall leaves from Toy Box. “If you are Grouchy”, is from Inky Antics. Hope you can get out and enjoy this beautiful fall weather. I love this tag, the colour palette has such warmth which of course is what Yellow and Brown relate to the senses. Your design has a wonderful Wow factor too, just fabulous. Well Miss Vada, I love this masking beauty of a tag! 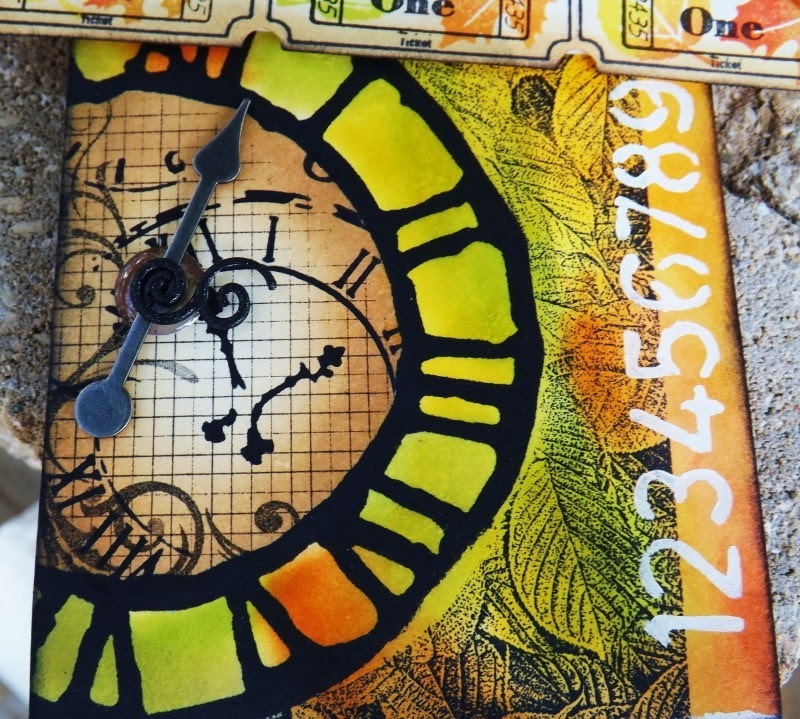 You know I have that CWS stencil and I love how you used it with the clock die! Beautiful Fall tag! We have cooled down, especially in the AM! Enjoy the nice weather and brace yourself for what follows :-)Hugs! 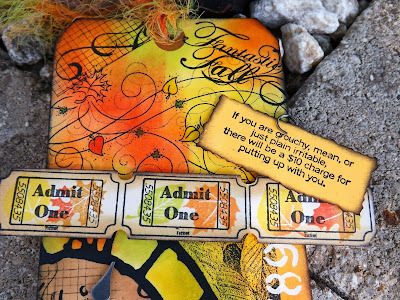 Great colors and stamping, love that sentiment, cool tag! Oh Vada! I need you to have a subscribe by email button so I don't miss one of your gorgeous projects! You are so talented! This tag is so perfect...stamping and color! Great design!